Have you suffered an injury and need to make sure that you keep your arm and shoulder in place? 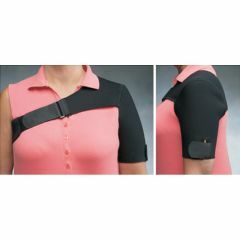 The right arm sling for the shoulder and shoulder orthoses can help immensely with this, and we have plenty available. Allegro Medical provides a range of shoulder slings, medical shoulder support devices, and shoulder immobilizers, along with a shoulder finger ladder, axial resistance shoulder wheel, push up blocks, power boards, and many other accessories. AllegroMedical.com provides the lowest prices you will find on the best products. You can put your trust in our Best Price Guarantee.